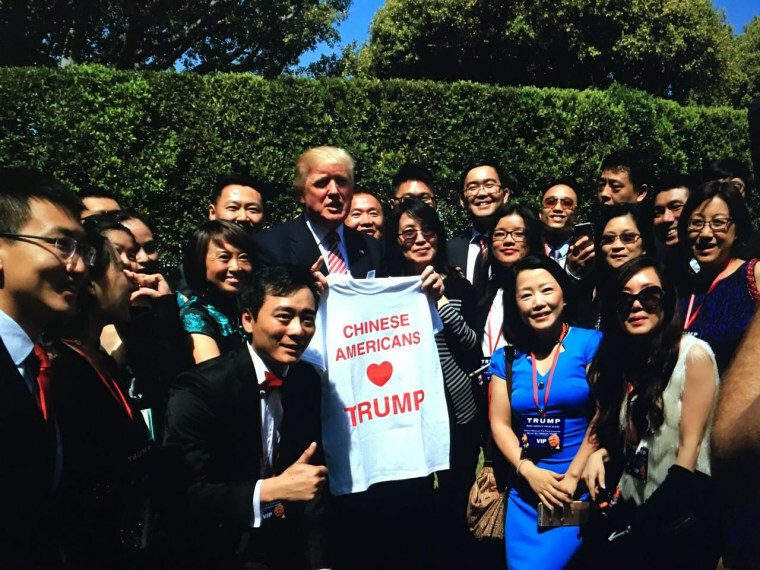 Asian Americans were among dozens of Donald Trump supporters who gathered in Washington, D.C. Friday with GOP officials and the Trump campaign to strategize ways of mobilizing minorities to vote for the presumptive presidential nominee. Vietnamese-, Chinese-, and Filipino-American members of the National Diversity Coalition for Trump were some of the 65 people who participated in the three-hour meeting just two weeks before the Republican convention kicks off in Cleveland, Ohio, on July 18. “We’re putting together our field program, we’re putting together grassroots strategies in order to engage all Americans — Asian Americans, African Americans, and Hispanics and Latinos — to support Mr. Trump’s candidacy,” Jason Chung, Republican National Committee director of Asian Pacific American engagement, told NBC News. During a phone conference Friday afternoon, several Asian Americans who sat in on the meeting told NBC News that participants discussed a blueprint for winning over the minority vote for Trump, including in battleground states. The plan calls for telephoning voters, registering eligible voters, and initiating one-on-one talks with members of the community, among other things. According to a new NBC News tally, battleground states include Colorado, Iowa, Maine, Nebraska, Nevada, New Hampshire, North Carolina, Ohio, Pennsylvania, and Virginia. The strategy is part of the RNC’s ramped-up efforts to engage the Asian American and Pacific Islander (AAPI) electorate, which in the last presidential election accounted for 3.8 percent of nationwide eligible voters, according to the U.S. Census. One component involves dividing up states into what the RNC calls "turfs" of between 8,000 and 10,000 voters, who are classified in the party’s voter file as “swing voters,” “persuadable voters,” and “low-propensity Republican voters.” A field organizer leads each turf, overseeing neighborhood team leaders who manage a group of volunteers. Tian Wang, president of Chinese Americans for Trump, told NBC News that his group, which he said now has over 6,000 registered members, has fundraised and canvassed for votes for Trump. “We’re trying to get some photoblogs going, and we’re training our members to be volunteers to try to spearhead” efforts in the Chinese-American community, said Wang, who did not attend the meeting. That Friday’s gathering — the first with the diversity coalition, RNC, and Trump campaign all present — comes only four months before November’s general election doesn’t worry Chung. “You have to realize, this is stuff we’ve been doing for the past three years at the RNC,” Chung said, adding that Trump will be the beneficiary of all this work in AAPI communities. Chung also said the GOP will use social media and place Asian-language ads on television and radio and in newspapers to further galvanize support for Trump. In recent years, the Republican party has made a concerted push to win back the AAPI electorate. According to Cornell University's Roper Center, AAPIs went from giving 55 percent of their vote to former Republican President George H.W. Bush in 1992 to just 26 percent to Republican presidential candidate Mitt Romney in 2012. While AAPIs are a diverse constituency, representing more than 48 ethnicities and speaking over 300 languages, GOP organizers also see them as a bloc that could potentially rally around Republican views on education and the economy. But Asian-American voters gave Democrats the advantage in dealing with both issues as well as a host of others, including healthcare and passage of immigration reform, according to the results of a survey released in May by nonpartisan advocacy groups. The threat of terrorism, the survey found, was the only issue Asian Americans thought Republicans handled better than Democrats, by a two percent margin. Overall, only 19 percent of Asian Americans viewed Trump favorably compared to 62 percent who felt the same way about presumptive Democratic nominee Hillary Clinton, according to the survey of 1,212 registered Asian-American voters. Reversing that mindset, GOP organizers say, is crucial to delivering the AAPI vote for Republicans. To that end, Vietnamese-American Trump supporter Kevin Do, who attended Friday’s meeting, told NBC News he personally plans to visit more homes of Vietnamese Americans in the coming months to bring them out to vote for Trump. In the last presidential election, 47 percent of registered Vietnamese-American voters said they leaned Republican, 32 percent Democrat, and 21 percent identified with neither party, according to Pew Research. Do added that his organization, the Vietnamese American Community of Georgia, for which he serves as vice president, has separately partnered with another nonprofit, the Asian/Pacific American Council of Georgia, to host nonpartisan voter registration drives. There are roughly 53,000 Vietnamese living in Georgia, according to the 2013 American Community Survey of the U.S. Census, the most recent data available. Filipino-American Herman Martir, also a member of the National Diversity Coalition for Trump, told NBC News he plans to share the strategies discussed at Friday’s meeting with his group, the Asian Action Network, a nationwide nonprofit founded 15 years ago that includes Democrats, Republicans, and those unaffiliated with a party. Meanwhile, the same week that Trump’s campaign met with the RNC and the National Diversity Coalition for Trump, the presumptive Republican nominee faced criticism over how he responded to comments a woman made at a town hall meeting in New Hampshire. To address the jobs shortage for veterans, the woman suggested that Trump employ them at the border or with the Transportation Security Administration (TSA) and asked him to "get rid of all these 'heebeejabees' they wear at TSA." The remark was presumably a reference to workers who wear the Muslim headscarf, known as a hijab. Trump replied, "We're looking at that. We're looking into a lot of things." At the same town hall meeting, a plane flying overhead caught Trump’s attention as he was talking about how he respects Mexico and how its leaders are smarter than those in the U.S. He looked up and said, “In fact, that could be a Mexican plane up there. They're getting ready to attack." Martir, who lives in Dallas-Fort Worth, Texas, said he believes the media often misinterprets Trump and portrays him as something he is not.